A question that may be on some people’s minds is whether the SEC whistleblower program is working as the U.S. Congress intended. A large part of the answer may come from SEC whistleblower program statistics. But statistics only tell part of the story. SEC and other government officials sometimes make public comments or statements about the program. These kinds of SEC whistleblower program statements can lend some context to the statistical numbers, and add information that statistics alone might not be able to account for. Just because a number is large does not necessarily mean it is “good”. Just because a number is small does not necessarily mean it is “bad”. For statistics to have meaning often requires having an understanding of the context and practical relevance of the numbers being cited. Broadly speaking, there are three types of public comments that might be attributed to SEC officials. The first type can be thought of as official or “authorized” statements. The second type can be generally considered to be the official’s own personal views. The third can sometimes be thought of as a “hybrid” of the first two. Official or “authorized” SEC whistleblower program statements tend to be found in official SEC press releases or similar materials. These kinds of materials, usually drafted by members of the SEC staff, and disseminated on SEC letterhead or on the SEC’s website, sometimes include quotes from SEC officials. Unless there is some note or disclaimer that the incorporated quotes are not to be attributable to the SEC itself, and assuming the quotes are from senior enough officials at the SEC, the quotes can probably be relied upon as official or “approved” statements. “Personal” statements by an SEC official are usually preceded or accompanied by a disclaimer. Typically the disclaimer says something to the effect that the statements made are the speaker’s own personal opinions, are not to be taken as official statements attributable to the SEC, are not an expression of any view or belief held by the SEC, and/or are not binding on the SEC. This is common when SEC officials give speeches to lawyer groups or industry associations, or at business conferences. There is also a type of statement that can be thought of as a hybrid of the above two categories: testimony, such as before the U.S. Congress. For example, periodically the SEC Chair may be called before a Congressional Committee to give testimony about the SEC whistleblower program. Technically, the SEC Chair is there in his or her “official” SEC capacity, but may also be asked questions calling for his or her own “personal” opinions. Sometimes government officials’ public SEC whistleblower program statements are generalized or even vague. This does not necessarily mean that the official is being evasive. It may be that there is not enough reliable information for the official to make a firm statement. Also, facts and circumstances change, and the SEC needs to be able to adapt or modify its position(s) as the circumstances may require in the future. For example, what if someone who eats a quart of ice cream every day asks you “does eating ice cream make you fat?” You would probably tell that person “yes”. But what happens when next month someone who exercises regularly and eats healthy decides to have a single scoop of ice cream — their only scoop all year? Would that one scoop make them fat? Your answer would probably be “no, not if it’s just that one scoop”. In other words, you need to be able to adjust your answer to the facts and circumstances of the “case” in front of you. The SEC needs to be able to do the same thing: what might be an intentional accounting fraud in one case might be just an innocent mathematics mistake in another case. SEC officials are sensitive to this, and are aware that people may be relying on what they say to guide their actions, so they have to be careful in what they say publicly. It is therefore good practice to interpret what government officials say, in their public SEC whistleblower program statements, in conjunction with other information available. Some examples of such other information might include statistics, trends, past examples, and so forth. By understanding that comments by SEC officials may not be “set in stone”, and by interpreting them in context, those public statements can sometimes provide insights into current trends or current ways of thinking regarding the SEC whistleblower program. U.S. Senator writes letter supporting the SEC’s whistleblower program. SEC Chair praises the Dodd-Frank whistleblower program. SEC Commissioner Stein calls the Dodd-Frank whistleblower reward program “a resounding success”. SEC Commissioner Peirce commends the SEC whistleblower program. SEC Commissioner Jackson hails the Dodd-Frank whistleblower award program. 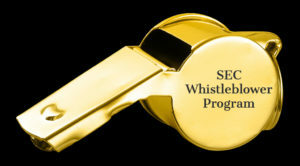 SEC Chair commits to staying “on the whistleblower beat”. SEC Enforcement Director praises whistleblowers and their hiring SEC whistleblower lawyers. SEC Chair testifies that the SEC whistleblower program has had a “transformative impact”.